I love the Winter Olympics. I enjoy the summer Olympics just because it’s cool to see the nations come together like that, but the winter Opympics are where the cool sports are. High speed downhill skiing, ski jumping, speed skating, it’s all great stuff. 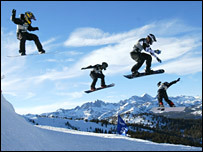 New this year is Snowboard Cross, which is groups of 4 boarders racing down the mountain to see who gets to the bottom first. No bumping or pushing allowed. That’s just cool. Opening ceremonies are tomorrow (Feb 10), and I hope to see them. I haven’t been able to watch since Albertville, and those were AMAZING.